Miniaturization and low power consumption are always challenges since the infancy of MOS type gas sensors. The world’s smallest class of new gas sensors with the lowest power consumption are being developed using MEMS technology, further broadening the field of application. Since its invention, the MOS-type gas sensors has been subject to the constant demands of miniaturization and reduced power consumption. Figaro has developed a wide range of sensor platforms such as the micro-bead type in an effort to reduce size and power consumption. MEMS type gas sensors are Figaro’s latest development suitable for being embedded in mobile and battery-operated devices. MEMS technology is responsible for making great strides in the miniaturization of electronic products. With the application of MEMS technology to gas sensors, Figaro has succeeded in developing world-class*1 gas sensors which are both small and have low power consumption. Combining superior MEMS technology and gas sensor fabrication techniques, Figaro has reduced the size of the gas sensing area to less than 1/100th of the area on printed sensors. Furthermore, a superior suspension structure for thermal insulation has reduced heat loss from the gas sensing component to an absolute minimum. Figaro has overcome the inherent difficulties in making sensors with a suspension structure durable by devising finely tuned thermal stress calculations to support this structure. semiconductor manufacture, adhesive fabrication such as thin-film deposition applying sophisticated manufacturing equipment, and subtractive fabrication techniques such as etching). 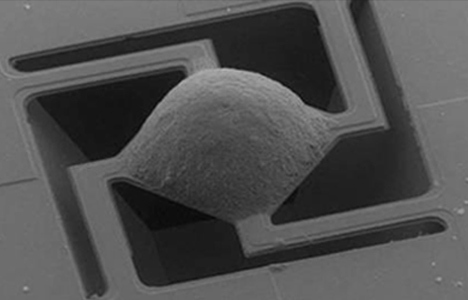 New gas sensors manufactured with MEMS technology are extremely small at 0.99mm×2.5mm×3.2mm. 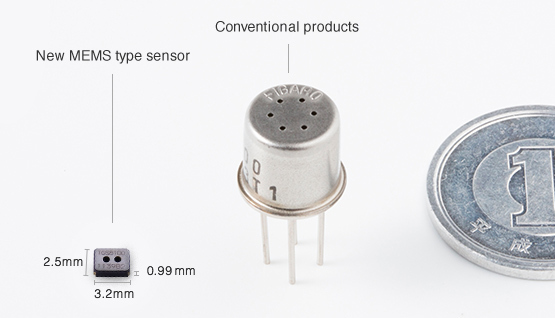 In contrast to conventional MOS-type gas sensors that are characterized by high heat output, Figaro’s MEMS sensors do not output high amounts of heat. 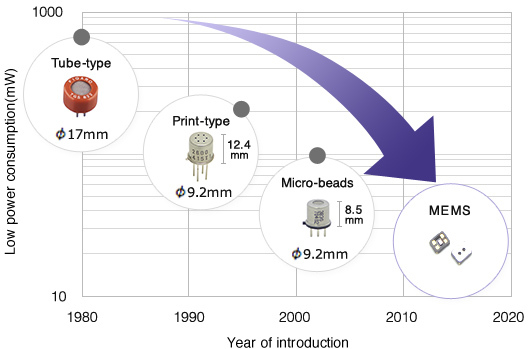 In addition to achieving sufficient miniaturization, ensuring long-term durability and robustness presented further challenges. By successfully addressing these challenges, Figaro Engineering has proven its prowess in the field of extreme products. To make full use of a gas sensor’s functions, the sensing element must be heated to a temperature of a several hundred degrees C. Conventional gas sensors consume considerable power (210mW). 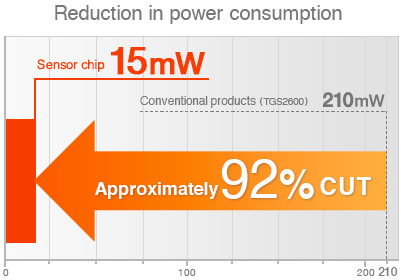 New products employing MEMS technology can reduce power to approximately 1/13th of conventional levels—as little as 15mW is required for precision gas sensing. Portable battery-powered gas detectors are now possible as well as a wide range of products with gas sensing functions. New applications and convenience are now possible over a wide spectrum. Due to rapid thermal response of the MEMS sensor, able to go from room temperature to operating temperature in just tens of milliseconds, applications for Figaro’s sensors can be expected to greatly expand. This short response time allows the heater ON time to be reduced with intermittent drive, thus reducing power consumption. The miniaturization and reduced power consumption of gas sensors allows for a practically unlimited range of application. Wearable devices and portable devices such as mobile phones and smart phones are obvious applications. Personal devices to check for bad breath and breath alcohol can become common in daily life. The ability to measure VOCs in new homes and to measure the air quality present the possibility of avoiding sick house syndrome and complications from asthma. Furthermore, the ability to monitor dangerous gases such as carbon monoxide and hydrogen sulfide with small devices will bring live-saving benefits. New products can be made smaller and more energy efficient. While individually these benefits seem small, when implemented on a large scale, these devices can make a significant contribution to the global environment. Progress in the portability of gas sensors has generated a strong interest from the air quality and environmental industries. The quantitative data about the environment by such devices can lead to a consequent increase in ecological awareness.